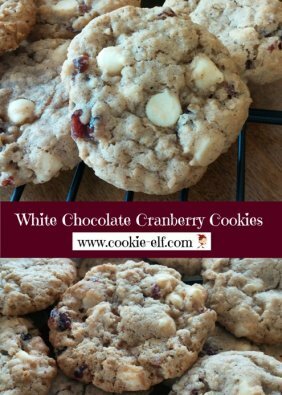 White Chocolate Cranberry Cookies are a unique variation of a traditional chocolate chip oatmeal cookie recipe. In this version white chocolate chips replace conventional semi-sweet chocolate chips. And where you might add raisins to the dough, you replace them with dried cranberries (Craisins®) instead. The result is a sweet drop cookie with bite – and a pretty one, at that. The white chips and red cranberries create a colorful contrast. Drop cookie dough varies in texture from quite soft to stiff. Like other drop cookies, these are formed by either “dropping” or pushing spoonfuls of cookie dough onto a baking sheet. This particular drop cookie recipe produces a stiff dough that must be pushed with a finger, spoon, or spatula onto the baking sheet. The cookies will be an even better shape when you lightly press down the dough with your fingers or the heel of your hand. During baking, the mounds of dough flatten and spread. Combine flour, cinnamon, baking soda, and salt in a medium bowl. Set aside. Gradually stir flour mixture into creamed mixture a bit at a time until well blended. Add oatmeal to the dough, a bit at a time. Cookie dough will be thick. Use a large mixing spoon mixing them in with a wooden spoon. Use a cookie scoop, small ice cream scoop, or kitchen teaspoon to drop rounded teaspoonfuls of cookie dough onto lightly greased baking trays, 2 inches apart. Lightly press down the dough with your fingertips or the heel of your hand. Bake 10-12 minutes until cookies are slightly golden around the edges. Remove cookie sheets from the oven. Allow cookies to sit for 3-5 minutes on the baking sheet before using a spatula to transfer them to a wire rack. Cool completely. Chop cranberries coarsely with a kitchen cleaver before adding to the cookie dough. This will distribute the cranberries more equally throughout the cookie dough and make cookies less lumpy.